Rowland Langmaid (1897-1956). Watercolour signed and dated 1925 (lower right). 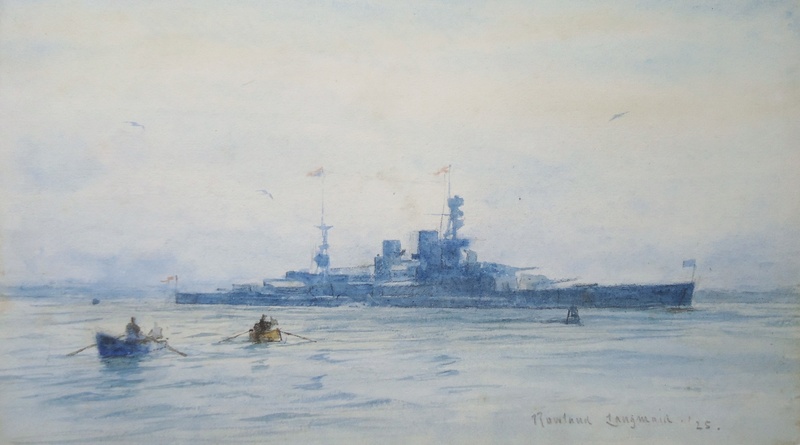 HMS REPULSE (Captain H W W Hope CB DSO RN) is painted here whilst carrying HRH THe Prince of Wales on one of his voyages around the British Empire and some of its most important trading partners. The battle cruiser is wearing his Standard at the main and his Trinity House jack at the fore. This particaular voyage in 1925 was to the Dominion of South Africa and to South American countries and although we know that the Prince was not especially enamoured of these "goodwill trips" he carried them off superbly and the two battle cruisers that were used for them, REPULSE and her sister RENOWN, were the perfect ships for the job, comfortable and well appointed for HRH and his small travelling Household and large enough with their fine lines and spacious apartments in which the Prince could return hospitality, to turn the heads of their host nations. Commanded by Four Ring captains the huge ships commanded a certain seniority at sea in their own right: Captain Hope was appointed CVO by the King on conclusion of this particular voyage.